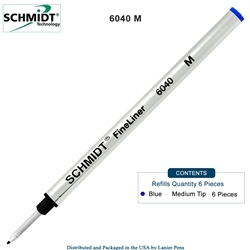 Schmidt Liquid Ink Refill 6040 FineLiner Fiber Tip 5888 Style Metal Body Refill.Reservoir based fineliner with metal tube and stainless steel front section extruded spring loaded 1.0 mm writing nib in a metal adapter for a smooth writing feeling. Universal Size Spring Loaded Fiber Tip Refill. Lanier Pens is your source for all Schmidt Pen refills including the popular Schmidt Liquid Ink 6040 FineLiner Fiber Tip Metal Body Refil.